S-Card for SmartClip is a Smart-Clip sub-device providing high level protection in the process of operation and updates. It’s a portable USB key for Smart-Clip updates, SmartMoto software operations and access to flash files database. Use of S-Card dongle frees Smart-Clip users from SmartMoto licensing process. From now on, Smart-Clip with S-Card dongle can be used on any PC and is not bound to computer hardware. Smart-Clip registered with the USB key has an access to the new level of flash files database at portal www.boot-loader.com. Smart-Clip2 Basic Set is a hardware solution that enables servicing, flashing and repairing for cell phones and smartphones based on MTK platform. No codes or credits required. 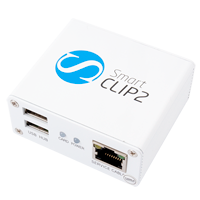 Smart-Clip2 Basic Set (with smart card activated) and extend its functionality with additional Smart-Clip2 Activations at your own discretion. Activate Pack 1 to perform full range of servicing operations with MTK-based cell phones: MTK IMEI Repair + MTK Calculator, along with numerous other procedures.